We are so excited to announce our August MOM of the month - Lisa Hyland. Lisa has been a member of Our Village for over a year. She's taken our Stroller Strides class, 2 Body Back sessions and our running club. She's overcome injuries this year and has found a source of inner strength as she navigates taking care of herself and two busy little boys. She's always prepared for classes with a big smile and positive attitude. Congrats Lisa and thank you for being part of our community! Hometown: I am originally from New York but we moved a lot when I was young. I attended five grade schools, moving from Long Island to Buffalo to Boston to Miami before spending most of my childhood in Naperville. Tell us about who is in your family: My house has me outnumbered, I am a #boymom! I have been married to Billy for twelve years. Our 3.5 year old Aidan is as carefree and active as they come. Owen is 16 months and a total life force. Current/Previous career: Pre-kids I worked in sales and marketing for retailers and agencies. I traveled a lot and worked crazy hours that weren't very family friendly. 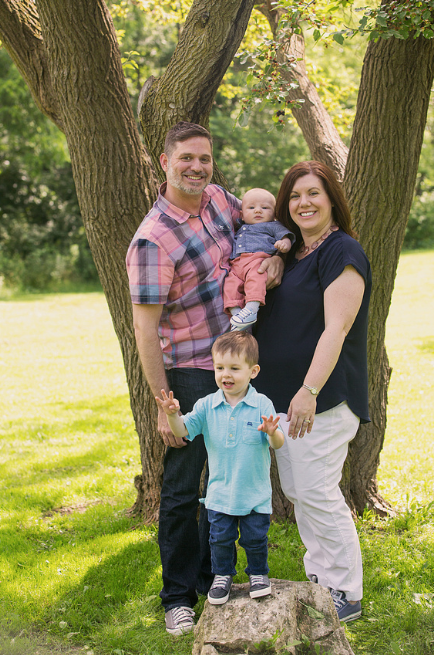 While pregnant with Aidan I had the opportunity to transition into independent consulting, working with photographers, start-ups and agencies from home rather than on the road. It was a great gig for that period in our life. After a lot of thought and a number of changes in our family's life I have had to step back and really ask what I want this one life to look like for me and my family. This week I officially put freelancing on hold and am transitioning into a new stage of being home full-time while I work on what is next for me. I'm going to need more playdates! What was your childhood ambition? Growing up I was a figure skater. While I was "good" I wasn't going to the Olympics. My version of the figure skating dream was to be a broadcast commentator. Even now, if you dare watch skating with me you have to put up with hearing every comment twice. First from me and then from the broadcast team. What does motherhood mean to you? Motherhood is helping me find myself more everyday. My kids are mirrors, reflecting back plenty of things that I wish I couldn't claim as my own but I have to. By doing that they are helping me evolve as an individual, a partner, a friend, a family member and especially as a parent. They also have a great way of showing the good right when I need some reassurance that we are growing in the right direction. If I can teach them only a fraction of what they teach me, I will call it a win. What is the furthest you have been away from home? Antwerp, Belgium. It was technically a work trip but fortunately with some of my favorite colleagues ever. The chocolate, the fries, the beer...not a very Body Back friendly place but YUM! How did you find FIT4MOM? After I had Aidan I was looking for something to do to get in shape. We had just moved to the suburbs but I was still spending a lot of time in the city so I tried a few classes and thought it was an amazing program and the marketer in me even thought it was a genius business. When Aidan got sick I put myself on the back burner and stayed there until after I had Owen. I was excited to see that Strides had made it to the area by that point and started attending classes when I could while we dealt with both kids health issues. Thanksgiving weekend of '15 I decided enough was enough, it was time to be a priority again and signed up for the January '16 session of Body Back. I haven't looked back since. How as FIT4MOM changed your life? I call myself a recovering perfectionist and F4M, especially Body Back, has helped me embrace progress over perfection. It made accountability a positive and accepting where I am at that moment OK. It's given me a place to be very vulnerable while feeling completely safe and an opportunity to reciprocate when someone else needed that support. I have been inspired by watching friends take their journey and smash their goals. I have been able to not only make changes in my own body but also shape my mind to believe that they can be lasting changes. And both Body Back and Strides have taught me that health and fitness can be fun....it doesn't have to be so serious! Favorite exercise: Tabata! It's intense but you know it will be over very quickly. As Erica says, after childbirth you can do anything for 20 seconds! Proudest moment: Every moment that I show up and am present. Excuses are easy, showing up is hard, so I try every day to show up wherever or for whatever is needed most at that moment. Tell us something about yourself that would surprise us: I would say, I love Rose but let's face a good number of you do in fact know that so...despite how you see me everyday, I am a total girly girl who also loves old school hip-hop and R&B. I love hair, makeup, shoes, shopping and a really sick beat.